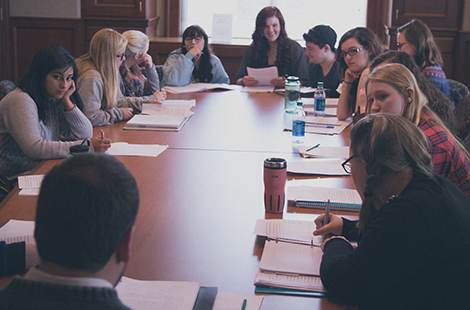 While most college literary magazines offer undergrads the opportunity to edit submissions from their peers, Trevecca gives them the chance to shape the work of professional writers. The editorial staff of The Cumberland River Review, Trevecca’s literary magazine, is composed entirely of undergraduate students. Published quarterly online, the magazine features new poetry, fiction, essays, and art. The journal accepts submissions from nationally published writers and artists. The project was developed and is led by Graham Hillard, an associate professor of English. He saw The Cumberland River Review as a way to bring a well-rounded education to his students. Hillard proposed the groundbreaking project as part of Trevecca’s Faculty-Led Academic Research Experience (FLARE). FLARE is part of Trevecca’s Quality Enhancement Program, which is focused on undergraduate research. The project is designed to help students gain experience in all parts of the editorial process, Hillard says. They will read and vote on submissions, attend regular meetings and take part in the responsibilities of compiling and organizing a quarterly magazine. Sophomore Amanda Johnson, who serves as an editor on The Cumberland River Review, says the experience has been “formative” for her. “It has definitely been a really formative experience in my own writing, showing me, through the works of writers around the world, what works and what doesn’t,” she said. Hillard’s students will also head to Los Angeles for the Association of Writers and Writing Programs (AWP) Conference, March 30-April 2. Students will attend panels on the business of publishing as well as the craft of writing alongside professional writers, editors, teachers, students, and publishers. The editorial staff will also have another important job at the conference: representing The Cumberland River Review. “At the AWP conference, they will man our table at the book fair, where potential magazine contributors meet editors and form professional relationships,” said Hillard. The conference will also provide an invaluable opportunity for the students to network, Hillard said. Ultimately, he hopes his students will be more prepared for their future careers. Johnson, who will be part of the group traveling to AWP, is excited about the opportunity to network with writers, editors and agents. To view The Cumberland River Review online, click here.